Bamboo Applicator Sticks: Our bamboo skewers measure 10" in length by 1/8" (3.5mm) in diameter. 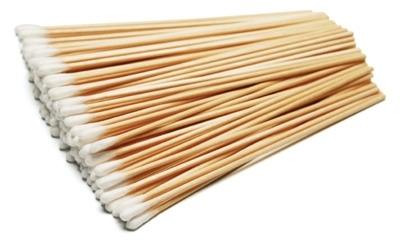 Cotton Swabs - Standard, Style 806: Style #806 is a standard round tipped cotton swab that is single tipped, and attached to a 6" x 1/12" applicator stick made of hard white birchwood. Cotton Swabs Style 310: Style #310 is a double tipped applicator that has a conical or cone like shape on both ends. Cotton Swabs Style 320: Style #320 is a single tipped applicator that has a some what loosely packed, oversized tip with a 3/8" diameter. Cotton Swabs Style 330: Style #330 is a double tipped applicator that has the shape of a standard swab, only the tips are about half in size. Cotton Swabs Style 340: Style #340 is a single tipped applicator that has one end that is the size and shape of a standard swab. Cotton Swabs Style 350: Style #350 is a single tipped applicator that is a sharpened applicator stick that has a thin wrapping of cotton. 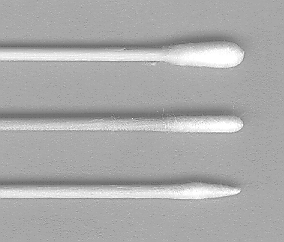 Cotton Swabs Style 826: Style #826 is a mini-pointed cotton tipped swab that is single tipped, and attached to a 6" x 1/12" applicator stick made of hard white birchwood. Foam Tipped Applicators Style 1803-WF: Style #1803-WF is a single tipped foam applicator that has the foam bonded directly to a 3" long wooden shaft. Foam Tipped Applicators Style 1806-WCF: Style #1806-WCF is a single tipped foam applicator that has the foam tip bonded over a cotton tipped applicator to a 6" long wooden shaft. Foam Tipped Applicators Style 1806-WF: Style #1806-WF is a single tipped foam applicator that has the foam bonded directly to a 3" long wooden shaft. Wooden Applicators: Our thin wooden applicator is made of hard White Birch wood and has flat cut ends. It measures 6" in length with a 1/12" (2mm) diameter.